Located in the middle of Turkey, Cappadocia is a great stop in any Turkey trip. The landscapes are fantastic, the underground cities are amazing and Goereme, the center of the region is a great place to stay. 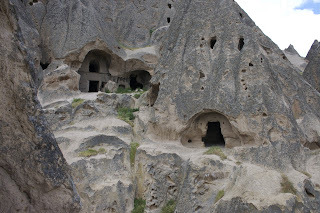 The unique features from Cappadocia come from its caves, carved in the chimneys or cliffs that shape Cappadocia’s landscapes by populations throughout the last 30+ centuries. The sights are somewhat reminiscent of Utah or Arizona national parks (think Grand Canyon), but the countless homes or churches carved in the rock add a historical twist to the visit. 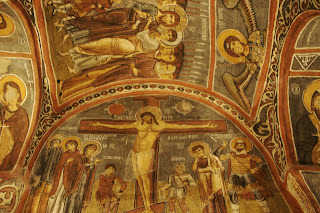 We were very impressed by the frescoes that decorate some of the churches: very elaborate and well preserved. 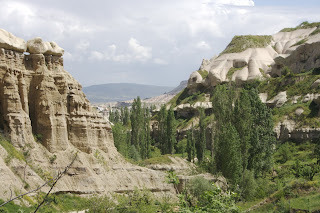 A great way to visit Cappadocia is to explore the various canyons on foot. There are several around Goereme, all between 4 and 10 km long. Some paths are a little bit challenging (long dark tunnels and wood ladders). But we managed well despite having a baby in a baby backpack with us. (no, Daniel didn’t hike the canyon himself, although a few tourists felt encouraged about starting the hike, from seeing him run around at the end of the path. They thought that even he was able to hike the whole thing!). 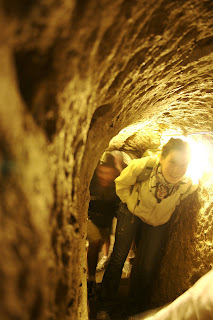 In any case, the paths lead to wonderful views of the region and interesting caves to visit. We can particularly recommend Rose Canyon, which starts at the top of a canyon above Goereme and goes down in the midst of yellow/pink cliffs. Fantastic! 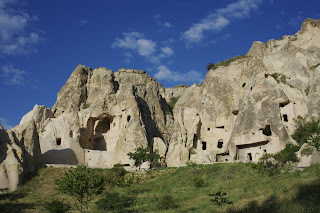 We also visited the Selime Monastery, built half-way through a cliff, with 5 or 6 connected rooms, incl. a 2-story church and a chapel. The architecture of this complex is just amazing. If you stay in Goereme, you will have to take a car or bus to visit, but it will definitely be worth it. 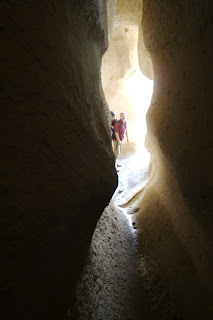 Another great attraction of Cappadocia is the underground caves, built to protect as many as 10,000 people from invaders across the region, as early as 7th century BC. 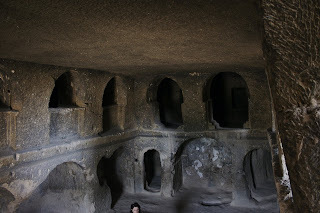 The size and sophistication of these caves (up to 8 stories, connection tunnels, large stones set to be rolled to close tunnels in front of enemies, large underground churches) are impressive. Hard to imagine how people could live there, but obviously this was a good option when faced with the risk of attack. We particularly liked Kaymakli and Derinkuyu caves, but we are not the only ones, judging from the number of groups visiting along with us…. A good way to get a sense of how crowded these cities would have been at the time! Goereme is a great place to stay, central, and just pleasant. 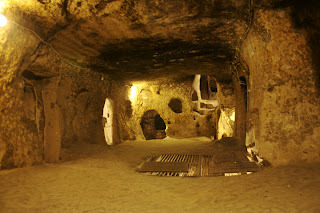 Most hotels are built on original caves, which makes it a unique experience and also prevents large tour groups from staying in Goereme (since most hotels have less than 20 rooms, all very different from each other). Add to this the many restaurants offering terraces outfitted with comfortable, red cushions, and the typical carpet stores and tour operators. In essence, Georeme still feels like a backpacker place. We can particularly recommend the Kelebek Hotel and AlaTurca restaurant. Some of the photos remind me a bit of Mesa Verde in Colorado, too. This looks like such a great place to explore! I've seen photos of the caves before but didn't realize there were canyons throughout this area. It all looks really fascinating.